ww2dbaseThe 3-inch M1917 and 3-inch M1918 anti-aircraft guns were the United States' first dedicated anti-aircraft weapons. In the late 1920s, they were fitted with removable barrel liners and redesignated 3-inch M1, M2, or M3 guns, depending on the variant design that they were upgraded from; the M3 variant were the most numerous. Efforts to further upgrade the design took place in the 1930s, but ultimately these projects would be canceled in 1938 as the 90-millimeter M3 gun rendered this WW1-era design obsolete. Nevertheless, as war loomed near, the United States Army looked to bolster its forces any way it could, and these weapons remained in active service. In Sep 1940, a project was started to adapt the 3-inch M3 anti-aircraft guns into anti-tank weapons. This was achieved by marrying the T9 variant design of the 3-inch M3 weapons with the breech, recoil system, and carriage of the 105-millimeter M2 howitzer design. Accepted for service, they were re-designated the 90-millimeter M3 anti-tank guns and were mounted on various types of tanks and self-propelled guns. 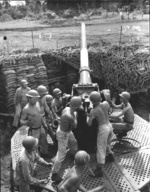 Many of the 3-inch M3 guns also remained in use during WW2 without conversion, deployed in forward areas mainly for anti-aircraft defense of bases and airfields.